One of the most interesting things about Russian modernism is the number of prominent women artists. Art historians still debate why this was so. It may be because women were admitted to the Academy in Saint Petersburg as early as 1871 (slightly later in Moscow), and that the artists of the avant-garde in Russia around the time of the Revolution (1917) were part of a new middle class in Russia that emphasized equality and education. One key component to women’s prominence in the forward looking art styles was the fact that traditional Russian folk art, including embroidery, were major influences, blurring the hierarchies of what was deemed “fine art” in most western European countries. Natalija Goncharova is a unique figure in this period because she painted in many of the newest styles: Cubism, Futurism, Rayonism, and Suprematism. She also created designs for theater stages and costumes. Goncharova was educated and her style blossomed in Moscow during the fruitful pre-revolutionary period. She was a leader—along with her husband, avant-garde Russian pioneer abstractionist Mikhail Larionov (1881–1964)—of artists who espoused traditional Russian art infused in the latest avant-garde movements in Western Europe, especially those based on Cubism. She painted in many of the contemporary western styles, but what is particularly interesting is her interest in “neo-primitive” art that had a basis in Russian icons, Chinese art, and Japanese prints. Rayonism: Blue-Green Forest comes from the period when Goncharova and Larionov introduced Rayonism (or Rayism), officially in 1911. Rayonism was based on the principles of movement found in Futurism (ultimately based on the idea of elapsed time in Cubism), and the principles of fragmented form found in Cubism, but was primarily focused on representing the idea of rays of lights reflecting off of objects. The style is sometimes called Cubo-Futurism because of these influences. The painting also points out the influence of Orphism, a color-infused version of Cubism. In 1913 she and Larionov published a manifesto on Rayonism. In 1915 Larionov and Goncharova moved to Paris to produce sets for the Ballets Russes, essentially bringing Rayonism to a close. When they returned to Moscow after the revolution, Constructivism and Suprematism had center stage in Russian modernism. 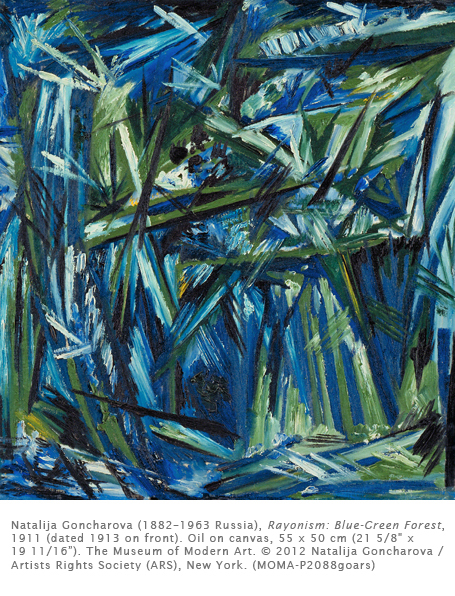 Although Goncharova gradually rejected overt French influence in her painting, she still believed that progressive ideas about style were valuable to Russian art. Activity: Create a drawing or painting of an abstract tree. Use tempera paint, markers, crayons, or colored pencils to produce a drawing. Base the work of sketches of real trees. Simplify the shapes and lines found in the realistic sketches. Try to create a color scheme that is not realistic.